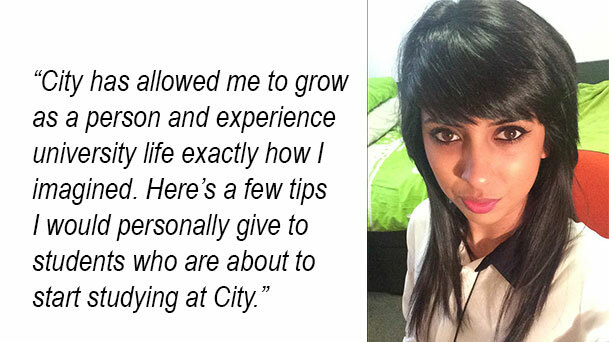 Recent graduate, Shivani Thakar, shares her top 10 tips for starting university life. I have just completed my third year at City and these three years have been the best. City has allowed me to grow as a person and experience university life exactly how I imagined. Here’s a few tips I would personally give to students who are about to start studying at City. 1) Be confident and approachable – On your course welcome event and induction day make sure you bring your smile! Approach other students, have a conversation and don’t forget you are all in the same position. 2) Sign up for clubs that interest you- I would suggest you register yourself for clubs/societies that interest you even if you decide it is not for you in the end, you would still be able to meet people with a similar interest. Attend the fresher’s fair to find out what’s available. 3) Attend fresher’s events- Attending fresher events allows you to meet people within your year and enjoy the company of fellow students as well and enjoying a day/evening out. 4) Don’t forget to study- Having fun is all good however, do make sure you keep on top of your work and study from the start. You will find this very beneficial when you’re not pulling your hair out around exams time. 5) Stay organised- Organise your work say in terms of modules, make sure you know where you keep all your work because losing that one bit of paper that is crucial for you is a painful feeling. 6) Do not hesitate to talk to lecturers- Your lecturers are there to help you, so make the most of it. If you need help or have a question do not be afraid to ask because the chances are someone else has the same question. 7) Clarify your work with fellow course mates- If in need of help regarding coursework, for example, communicate with your course mates. 8) Use Moodle efficiently- Use the material provided for each module on Moodle, for example; lecture notes and previous coursework/class tests. Using material is a good way to ensure you are following the syllabus and preparing yourself for exams. 9) Do extra research- Gain a wider understanding about a topic you do not feel as confident with. For example, use YouTube, online notes and books to help ensure you have understood something you were previously unsure about. 10) Finally, have fun! - Enjoy yourself, balance your social and work life and ensure you enjoy your time at City and make the most of being in Central London.